Ever seen a natural texture, hand rubbed 3 tone burst finish? Look closely at these pics! 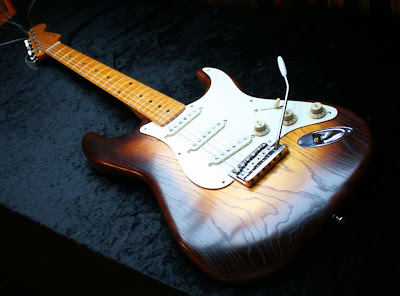 Our friend Andy Preston of UK based www.wudtone.com (Wudtone Custom Guitars, Finishes, Parts) puts together great Strat configs with these amazing finishes! And he even sells DIY finish kits so you can do something like this on your own. Today's featured burst was put together for a customer, and also includes Andy's constant pivot trem. Specs are below, along with links for more info. Single piece super lightweight Swamp Ash. Accurate 50′s shaped, deep tummy cut, curves. Birds Eye Maple neck, 52 V, 7.5 radius, vintage fret wire, no skunk, no olive. 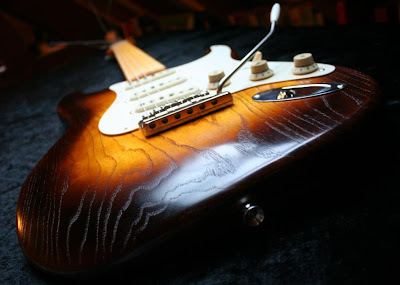 Neck Finish – Wudtone Aged Vintage Yellow. Wudtone Neck Plate & Screws. Wudtone Constant Pivot Tremolo and 1018 Cold Steel Tone Block. Aged parchment guard with cream control knobs.